Well, one tactic to feeling less poor, is to interrupt routines, make things special. For example, simply eating by candlelight can change an entire dining experience, and costs very little. S is a master at this. 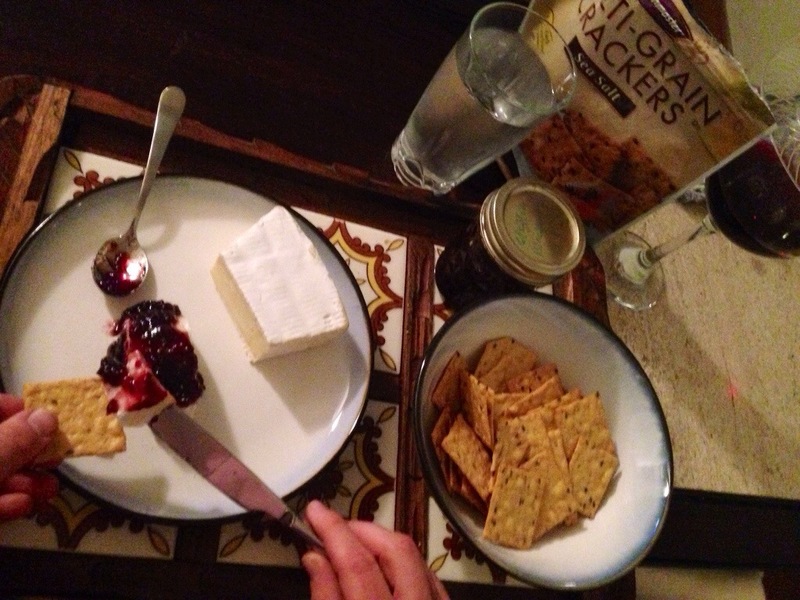 The other night, S came home from work with a surprise: brie cheese. I never explored the cheese world much (eating mostly cheddar, mozzarella, and Parmesan), until I moved to Europe and couldn’t find cheddar cheese to save my life. I settled on Gouda and Edam cheeses as my go-to cheese while I was in Sweden. Cheese was served at a lot of different functions in Sweden, so it’s not surprising that they had actual cheese shops there – shops dedicated to cheeses, with a shelf gourmet crackers, and a little sausage. I sampled many cheeses during my two years abroad, but never learned the names of most of what I tried. I was not sure if I had tasted brie cheese before. S sliced some and put it on a cracker for me. Delicious. I had definitely eaten it before, but I did not know its name. Then, he added some home-made blackberry jam to the cheese. It was sweet, but not too sweet. We poured some wine. The blackberry jam brought out the blackberry tones in the wine. The jam was a gift. We already had the cracker and wine. All he bought was the cheese. Yet, it was the sweetest time we shared, doing something special, something uncommon, something classy. I’m so glad we try knew things together, and I’m so very grateful to be married to someone who understands the importance of making time to share a moment together.